It’s official: Attorney General William Barr will NOT let Congress—or the American people—see Mueller’s full findings on the Trump-Russia investigation. 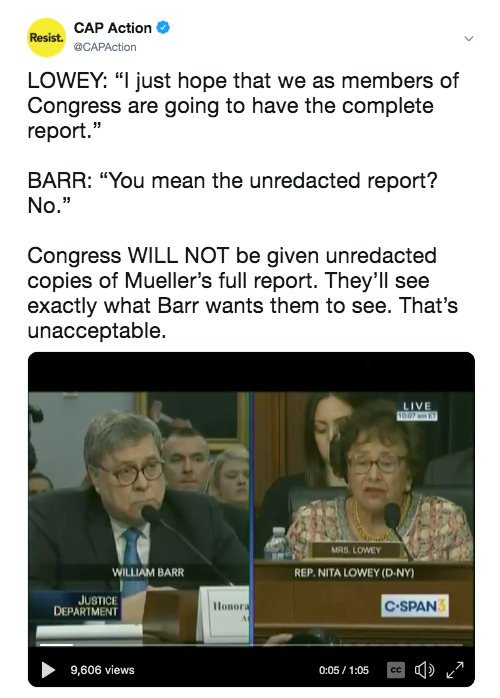 In today’s House Appropriations Committee hearing, Barr made it clear that he’s fulfilling his cover-up role as Trump’s attorney general. Americans deserve transparency. Share this video on Twitter to demand it. Congress has a right to see the full Mueller report. Here’s why. When asked if the White House has seen or been briefed on the report, he refused to answer. Americans deserve to see the full findings of Mueller’s investigation—even if Barr is intent on obstructing them. Share this tweet to demand the full truth. Barr also demonstrated today that he’s willing to lie to for Trump on multiple fronts. FAMILY SEPARATION: He lied about Trump’s family separation policy: “I support the president’s policy, which is we’re not going to separate families.” Trump forced out his DHS secretary TWO DAYS AGO for refusing to enact this very policy. HEALTH CARE: When asked about the Trump administration’s latest attack on the Affordable Care Act, Barr lied again, claiming that Trump supports protections for people with pre-existing conditions. In reality, Barr is currently championing Trump’s efforts to dismantle the ACA through the courts.